Searching is a damn good first feature-length film for a very promising filmmaker. - antoniocudemos Webseite! Searching is a damn good first feature-length film for a very promising filmmaker. Let’s first say: „I loved searching“! It’s a fantastic thriller film, directed by Aneesh Chaganty. The whole movie is set entirely on a computer screens and it’s been shot on an iPhone 7. I’ve myself shot short films on an iPhone 7 and you couldn’t tell at all. Just amazing. It made over 65 Mio worldwide already, and it’s still in cinemas. For example here in Germany. 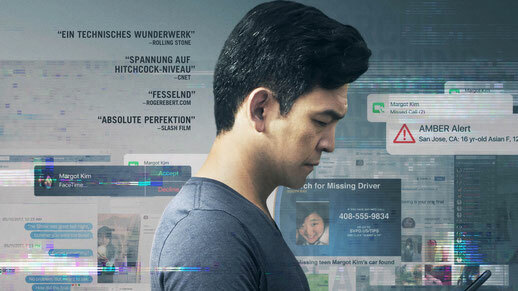 The story follows a widowed father, David Kim (John Cho), whose fifteen-year-old daughter, Margot (Michelle La), goes missing after a nighttime study session. After contacting the police, he’s advised by the investigating officer, Rosemary Vick (Debra Messing), to take part in the search, and he does so by rummaging through the contacts on her laptop computer, questioning people she knows, and uncovering aspects of her life that she had kept hidden from him and that may have played a role in her disappearance. Already the long video montage at the beginning of the movie, is great. It reminded me a bit of Up, Pixar’s Masterpiece. It’s a a five-minute montage that introduces us to the central characters. It really effectively establishes a very strong emotional connection between the characters and the audiences that resonates throughout the course of its 101-minute running time. I had to care for the father right away and of course for the missing daughter. There were a couple of times I thought I had figured out the mystery. But I failed most of the times. That’s also why I couldn’t stop watching. Their twists are good. Also all their easter eggs are fantastic. I had to watch it a second time, to see many more. The movie it’s self was just in just 13 days. At least I’ve read that on IMDB. I just my feature film „Focus“ in 14 days, and Post took around 3 to 4 months. What’s amazing in „Searching“ is that it took them over a year and half for the editors to assemble the movie. They had to write a whole new script for all the things we see on the screen. If you watch the movie, you almost don’t think about that (which is a good thing). All the screens, pictures everything you see, had to be made because of copyrights etc. I need to give them so much credit for making all the things we see on the screen look so well and feel like a real thing, because they had to make it from scratch. Overall, Searching is a blast. Like I said above, one of the biggest surprises of the year. It's very well-acted with a very strong performance from John Cho. The writing is clever and intelligent. Specially it's a damn good first feature-length film for a very promising filmmaker. If you have a chance go watch the movie. A great roller coaster of a movie with many surprises and a great ending.